Avocados are a favorite because they contain healthy fats and fat-soluble nutrients. This twist on guacamole is filled with flavor and disease-preventing goodness. Whisk lemon juice, olive oil, stevia and sea salt. Mix avocado, zucchini, and basil, drizzle with dressing and sprinkle with chopped chives. 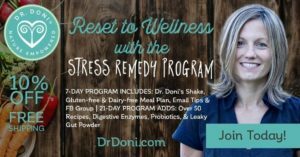 Filed Under: Eating Well Tagged With: diet, healthy eating, natural health, recipes, What's Dr. Doni Eating?